Far From Over (shown here still trailing the field) rallied to pull off an impressive win in the $250,000 Withers Stakes today at Aqueduct. Here’s a horse with a lot of determination and an appropriate name: Far From Over stumbled badly breaking from the gate, trailed the field until the final turn and still managed to blast up to the front and win decisively. What a tactful ride by Manny Franco, who let the young horse (this was only his second race and his first graded stakes race) settle after the stumble, then helped him find his stride and keep him focused and calm up and through his explosive sprint at the end, passing the favorite El Kabeir. 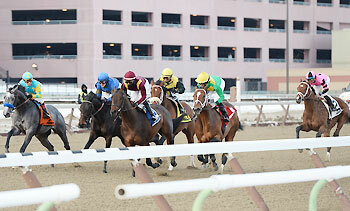 The 250,000 Grade 3 Withers at Aqueduct is a Derby prep race. Can a Mechanical Horse be around the corner? So exciting to watch. I love a good underdog story! Thanks for sharing this.